European corn borer (ECB) adult catches have remained fairly stable in blacklight traps over the past week. The most consistent catches are in parts of Burlington, Gloucester, Salem and Mercer counties (see ECB map). Cooler weather has likely slowed the progress of this first flight. With much higher temperatures forecast through the weekend, expect moth numbers to increase all over the state. As yet, larval infestations in sweet corn have been below 1%, but this will change quickly as warm weather dominates. Early plantings are now in the whorl stage, with some reaching pre-tassel in southwestern areas. Within a week, feeding should be apparent on these plants. 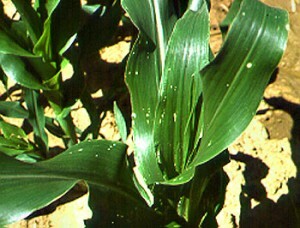 Consider treating if 12% or more plants exhibit the characteristic “shot-hole” type feeding on leaves. It is not too early to consider ECB management tactics on later stage sweet corn. Remember to make a full-tassel application to control ECB larvae as they leave the tassel and travel down the stalk to re-enter the plant near the ear shank. This last application is often critical to controlling ear infestations from ECB. A single corn earworm moth (CEW) was captured in a blacklight at Cinnaminson in Burlington County this week. Around this time, a few overwintered individuals may be caught in our traps. These moths typically do not represent a threat, as silking sweet corn is not present. As the first plantings go to silk, should we capture CEW even at low numbers, the danger of infestation will be significant. As silks begin to appear, pay close attention to CEW catches in local blacklight traps, and treat silking plantings accordingly. With cool, wet weather over the past week, ragged holes have appeared on many seedling stage plantings. Close observation of this damage reveals dried residue where garden slugs have been. These mollusks hide in soil cracks or under clods or debris during dry periods and emerge at night or during cloudy, wet weather to feed. This damage is unsightly, but not usually terminal to plants. Dry, warm weather will put an end to slug activity, and spur the corn plants to grow quickly. Heavy egg laying by imported cabbage butterflies (ICW), and diamondback moth (DBM) continues. Infestations of both pests have been found in the central counties, and are certainly present further south. Scout plantings weekly. Check 5 consecutive plants each in 10 random locations throughout the planting, paying particular attention to the innermost leaves where ICW often feed. Consider treating if caterpillars are found on 10% or more plants that are in the 0-9 true leaf stage. From 9-leaf to the early head stage (in broccoli, cauliflower and cabbage) infestations up to 20% may be tolerated. Once heads begin to form, a 5% threshold should be observed to protect the marketable portion of the plant. For leafy greens such as collards and kale, 10% plants infested is the threshold throughout. Many early tomato plantings are now in the field. Pruning and tying of plants is on-going. Remember that any event that results in contact with the plant causes numerous injuries to them. While these injuries heal, they serve as avenues of entry for bacterial pathogens that may be present either on the plants or in the field. Serious bacterial pathogens of tomato include bacterial leaf spot and bacterial canker. Both can result in unmarketable fruit, and canker can kill plants prior to the production of fruit if the infection occurs early enough. Timing and rates for applications of copper and/or the plant defense activator Actigard are detailed in the 2013 Commercial Vegetable Production Recommendations. These products provide some suppression of bacterial pathogens. It is critical, however, that spread of bacterial organisms be limited as much as possible. Avoid working in fields when plants are wet. When work is to be done in more than one planting, always work from youngest to oldest plants. This prevents workers from transporting bacteria to younger plants, where infections can result in increased crop loss. Remember that the earlier a plant is infected by a bacterial pathogen, the more likely it is to produce unmarketable fruit. Only a few BMSB adults have been captured in blacklight traps thus far. As adult captures increase to 5/night in parts of the state, maps will be produced to show where activity is highest. Information on scouting, crop injury and control will also be included.